Buffalo chicken sushi with carrots, celery, blue cheese and crumbled cheese tortilla chips. Last week I went out for sushi and that got me thinking about making sushi at home. Although I am still a bit leery about making actual sushi at home with raw fish, that does not stop me from having a bit of fun with sushi in the form of this buffalo chicken sushi! I am totally addicted to buffalo chicken in all forms and when I came across the recipe for buffalo chicken sushi on Choosy Beggars I immediately bookmarked it to try later! 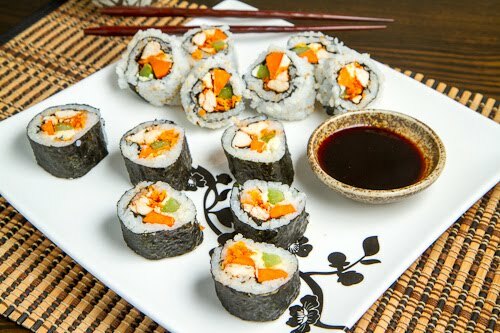 This sushi contains all of the flavours of buffalo chicken wings including the buffalo chicken, blue cheese, carrots and celery all rolled up in rice and nori. Sushi is actually pretty easy to make at home and this tasty buffalo chicken sushi is definitely worth the effort! 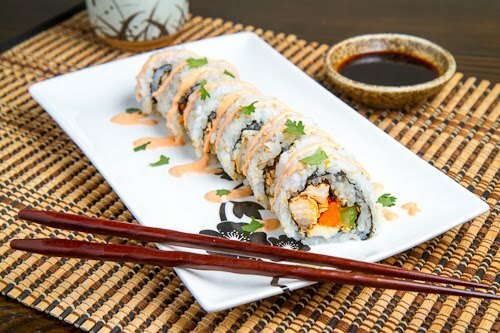 You can serve this buffalo chicken sushi with soy sauce, hot sauce or even blue cheese dressing for your dipping pleasure and I served it with a drizzle of mayo and hot sauce. Bring the water and rice to a boil, reduce the heat, cover and simmer until the water has been absorbed, about 18-22 minutes. Meanwhile, heat the vinegar, sugar and salt in a pan over medium heat until the sugar and salt have dissolved, set aside and let cool. Spread the rice out in a large wide bowl and fold in the vinegar mixture. Place a sheet of nori on a sushi mat with the shiny side down and cover 3/4’s of it with a thin layer of rice. Place a row of buffalo chicken, celery, carrots, blue cheese and crumbled tortilla chips down 1 inch away from the edge and roll it up. Repeat 3 more times. Slice the rolls into 6 pieces and enjoy! What a great idea! I also love sushi and have wanted to make it at home but haven't done so because of the raw fish issue. You'ev solved teh problem. Beautifully! WHAAAAAAT. Only you, Kevin. Only you! This is BRILLZ. going to include this with my "friday links" roundup! It was great getting to meet you in Seattle at BlogHer Food this year, Kevin! I think your recipes are consistently amazing and this one proves it. I love buffalo chicken salads and would never have thought of turning the flavors into sushi. Looks and sounds delicious! A terrific idea! I like it. Those sushi look really tempting and tasty. I laughed out loud at the idea! Now of course I have to try this. omg fellow Buffalo Chicken lover here! Love this idea! What a fun sushi roll! Hmmm hmmm so wanna try, but the last time I tried making sushi I was banned from Japanese night lol. Looks delicious! I've made sushi at home, but always with marinated fish, never chicken. Everything is better with buffalo sauce! Including sushi? Hmm. Have to try it! And making sushi at home (with raw fish) is not traumatic at all! I think you'd love it. After cutting back on the hot sauce a bit, I think I'd love every bite of this sushi! Great idea and reminder that we can make sushi with whatever fillings we want, Kevin, and still get excellent results. Kevin – we're so glad that you had as much fun with this idea as we did!! You did a great job on rolling the sushi too, judging by the lovely pics. Cheers to reinvention! Not kidding my mouth filled up with saliva the entire time I read your post! I'm Buffalo Chickens Biggest fan. no joke. I die for it. This sounds amazing. Ooo chicken sushi sounds lovely! I agree that making raw fish sushi is intimidating, and if you don't have access to sushi grade fish, it's probably not a good idea anyway. Luckily, there are a lot of maki combinations that include vegetables or cooked food. My personal favorites are grilled asparagus with sesame and smoked salmon and avocado. Good for you for thinking outside the box to use your favorite buffalo flavors. You'd better watch out that Nobu doesn't steal this one. I love this sushi. This is like a complete meal for me. This looks delicious that's why I will try this at home. Love this! My two favorite foods in one! I love sushi but hate fish. Vegetarian sushi gets boring after a while, so this is great!! Very creative. You have gone too far, sir. I DEFINITELY GOTTA try this!!!! Excellent idea, I think this is the single form of Buffalo Chicken that restaurants here in Buffalo do NOT have! Super creative, I can't wait to try it. Love your blog, never posted before, but I am constantly pinning your ideas!